Bloodstone Gemstone Bloodstone is a form of chalcedony, fine cryptocrystalline quartz. It has also been known as heliotrope, which means "sun turning" in Greek. Bloodstone is a dark green gemstone with red flecks. It is a form of silica quartz and it is also commonly known as green chalcedony. Bloodstone is still known by the name of heliotrope in Germany. The name 'Heliotrope' was given by the Greeks which means 'turning or revolving sun'. The bloodstone was believed to represent the blood of Christ Jesus. It is said that bloodstone was first formed when drops of Christ's blood fell and stained some green jasper at the foot of the cross. Because of the legend, the stone became a favorite material for carving Christian art and the gem is also referred to as the 'Martyr's Gem'. Plasma and heliotrope are two types of bloodstone. Heliotrope is lighter colored, somewhat translucent, and has red flecks while plasma is dark green, opaque, with little or no red in it. Bloodstone is considered a semi-precious stone and the stone should be protected from scratches and sharp blows since it is only rated at 6.5 to 7 on Moh's Scale. 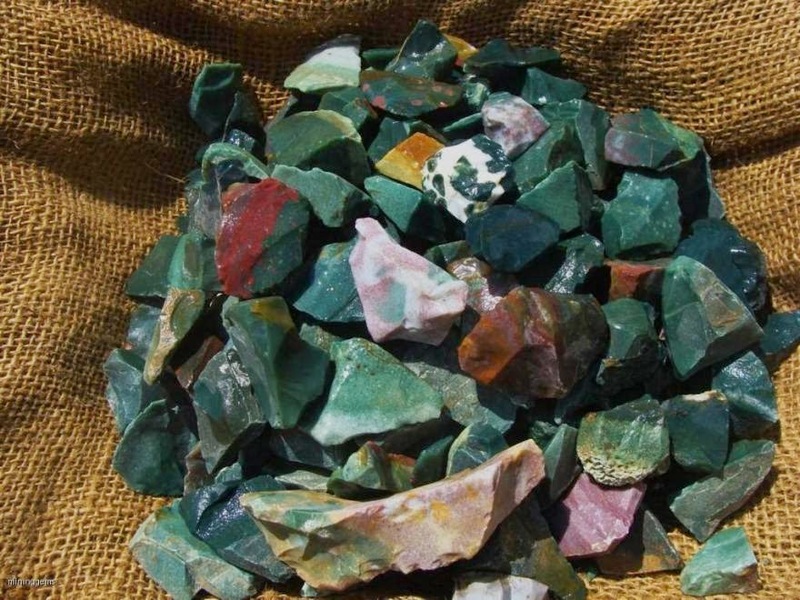 Bloodstone can sometimes be found mixed in with other type of minerals, or as pebbles along riverbeds. Uses of BloodstoneWear or carry Bloodstone as an amulet of protection against threats or bullying, whether verbal or physical, and for guidance to withdraw when appropriate and the courage to confront when needed. Sew a small Bloodstone in the coat of a child or teenager who is being bullied. Carry one for strength when adjusting to new circumstances. Wear or carry Bloodstone to increase mental clarity and to aid in decision-making. It provides a mental boost when motivation is lacking, and can revitalize the mind and body if you are exhausted. Bloodstone stimulates dreaming and heightens intuition. It is marvelous for increasing creativity and cultivating a project from the idea stage through to actualization. It encourages blessings and prosperity. Bloodstone is a nurturing mother goddess stone, helpful in easing misunderstandings or difficulties with mothers or mothering issues. It also assists human and animal mothers in the bonding process after a traumatic birth or one where mother and baby were separated for a time. Working with Bloodstone invigorates the system, boosting energy levels and increasing endurance in physical activity. It is beneficial for everyone from athletes to invalids for its steady vibration of purification and well-being. Use as a good luck charm for sports competitions or matches. An excellent stimulator of the immune system, use Bloodstone to ward off colds, flu, infections and inflammation. It is also a remarkable aid for revitalizing and re-energizing the body after illness, injury, or physical exhaustion. Bloodstone’s magical properties allow one to draw upon the power of the weather for personal healing, such as tapping into the winds to bring change or the rain to wash away sorrow.